Part of the mission of the U.S. Geological Survey (USGS) is to provide information on streamflow in the Nation’s streams to help understand the Nation’s water resources. Streamflow statistics are used by water managers, engineers, scientists, and others to protect people and property during floods and droughts, and to manage, protect, and enhance water resources. StreamStats is a Web-based Geographic Information System (GIS) application that was created by the USGS, in cooperation with the Environmental Systems Research Institute, Inc., that allows users to easily obtain streamflow statistics, basin characteristics, and descriptive information for USGS streamgages and user-selected ungaged locations on streams (Ries, K.G., III, Guthrie, J.G., Rea, A.H., Steeves, P.A., and Stewart, D.W., 2008, StreamStats—A water resources Web application: U.S. Geological Survey Fact Sheet 2008–3067, 6 p.,.). 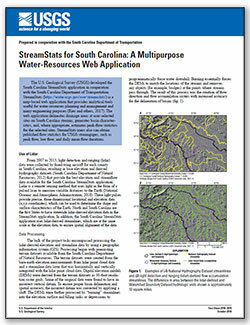 Print the results displayed in the user-interface map frame, the basin characteristics report, or streamflow statistics in the StreamStats ungaged site report. 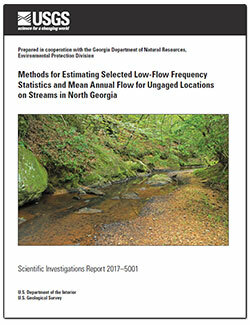 StreamStats can be used to obtain previously published basin characteristics and (or) streamflow statistics for over 700 USGS streamgages in Georgia. Any regulation to streamflow at the streamgage is noted as well as the type of streamgage, such as continuous or partial record. Currently (2014), 18 basin characteristics are available for a user-selected point on a stream (fig. 3). Streamflow statistics for a user-selected point on a stream are determined through the use of published USGS regional regression equations (Gotvald and others, 2009; Feaster and others, 2014). The user should be familiar with the limitations and accuracy of the regression equations before applying the resulting statistics. StreamStats automates and provides consistent results for many important computations necessary for the management of water resources in Georgia. Functions, such as automated basin delineation, determination of basin characteristics, and calculation of streamflow statistics at gaged and ungaged locations on a stream, were formerly time intensive and often not reproducible. The Web-based application incorporates important local datasets developed by the State, as well as established national datasets in a framework that allows future updates to be made. Applications as diverse as planning for bridge and road construction, managing water-resources quality and quantity, characterizing drainage basins, or examining the effects of urbanization on streamflow can be implemented with the Georgia StreamStats application. 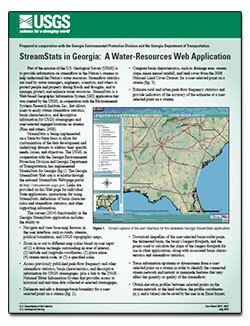 Gotvald, Anthony J.; Musser, Jonathan W.
Gotvald, A.J., and Musser, J.W., 2015, StreamStats in Georgia—A Water-Resources Web application, U.S. Geological Survey Fact Sheet 2014–3027, 2 p., http://doi.org/10.3133/fs20143027. 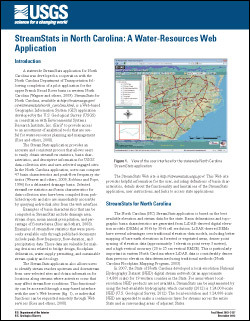 Weaver, J. Curtis; Terziotti, Silvia; Kolb, Katharine R.; Wagner, Chad R.
StreamStats in North Carolina: a water-resources Web application; 2012; FS; 2012-3137; Weaver, J. Curtis;Terziotti, Silvia; Kolb, Katharine R.; Wagner, Chad R.